The hornblower, Celia discovered – when her bus finally dropped her two hours behind schedule outside Ripon town hall – did exactly what it said on his tin. 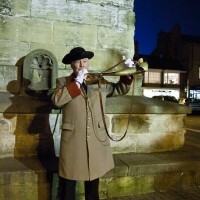 Every night he blew a horn in Ripon market square. Celia suspected this might have been what the mayor had been talking about when she was admiring the Galliano-esque decorations on the Charter Horn. Perhaps she should have listened more carefully, but, really, it had been a bloody day with the cold train and the car hire failure and all that. Despite Celia’s tardiness, the hornblower welcomed her to the council chamber with warmth and enthusiasm. Even though he had a good ten years on her, he possessed such formidable energy that she could barely keep up with him as he told her tales from his seven years in the post and filled her in on the history with colourful stories of marauding Vikings, Wakemen and Watchmen. A real character, Celia wrote in her notebook as he spoke to her. Then she added underneath: Where’s the crime in all this, though???? The hornblower was just launching into a story about the time he blew the horn out of turn because a magician friend of his wanted it to be part of his act, when there was a scuffle by the door and – to Celia’s dismay – in burst Colin, the large, be-slippered photographer from the day before, stuffing the end of a hot-dog into his mouth. While Celia would never put such junk in her body, the sight of food reminded her that it was nearly teatime and she hadn’t had a bite to eat nor even a sip of water since her hotel Full Yorkshire hours and hours before. Celia rolled her eyes at the hornblower, expecting him to be equally exasperated at this intrusion of the press, but instead the photographer’s presence seemed to light him up. ‘What can we do for you, then, Mr Photographer?’ the hornblower said, pulling on a long grey jacket with smart red cuffs and shiny brass buttons, and balancing a tricorn on his head. In the course of an hour, Colin snapped what must have been a hundred pictures of Celia and the hornblower posing in the council chamber, Celia and the hornblower in front of the market cross and – after a short drive in the hornblower’s Lexus – Celia and the hornblower beneath the silver lamppost that the hornblower explained is erected outside each new mayor’s house. ‘I couldn’t make it up.’ She treated him to one of her most dazzling smiles. Finally, Colin declared himself satisfied, piled all his equipment into a large bag, lit a cigarette and shuffled off. It had been dark for some time, and there was an iciness in the air that hinted at snow. Celia took her leave of the hornblower, who pressed his official photograph on her. He also gave her a CD of The Wakeman’s Song, that he had recorded with local folk singer Barry Sellers, which he said he normally sold for seven pounds for local charities, and a couple of his own lucky wooden pennies. Exhausted, Celia staggered towards the bus stop with her goodies. Her schedule had her down as interviewing passengers on the journey back to Harrogate. buzzing an alert that she had another tweet that she woke up in time for Harrogate Bus Station. Otherwise she would have ended up in Leeds. She disembarked and made her weary, hungry way back to the hotel, where she sat in front of the roaring fire in the bar and had another well-earned gin and tonic. She winked when she gave the handsome waiter her room number to charge her drink – it was a long time since she had used the tactic, but it had worked marvellously well when she took herself to Italy after her second divorce settlement came through. As she sipped her drink, she examined the day’s notes. All very interesting, if you went for that sort of thing. But it had provided no crime story ideas at all. It was utterly frustrating. Was she just going to have to make something up? She far preferred to use real life as a starting point. Bumping off ex-husbands, for example, had provided a fine literary distraction – until the libel case, of course. But nothing she had seen or heard since she had arrived had given her even an inkling of an idea. Everyone was just so damn nice, and cheerful, and positive. She took herself up to her room, and, after wolfing down a room-service curry and bottle of Rioja, took a hot shower, put on her negligée and stretched out on her bed to read a proof copy Samantha had sent her for a cover quote. It was one of these new psychological thrillers and it didn’t grab Celia’s attention at all. How could a book without a proper detective call itself a crime novel? After three pages, she nodded off. No Sergio type knocked at her door in the night. So at least she got a good night’s sleep. >> A story about the hornblower that Celia completely failed to listen to.